The NSGEU is proud to continue its safety awareness campaign in partnership with the Public Service Commission. The campaign is designed to draw attention to the public safety vehicles that you must also slow down and move over for if you see them at the side of the road with their lights flashing. 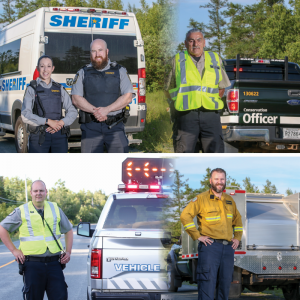 It features NSGEU members who are Deputy Sheriffs, Motor Vehicle Officers, Conservation Officers, and Forestry Technicians who fight wildfires. Twitter: #SlowDownMoveOver #OurLivesDependonit. You can view our short video here and don’t forget to click and share! For more information, you can visit our “Slow Down, Move Over” page.